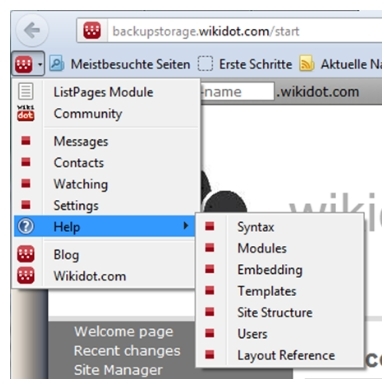 Firefox-Wikidot-Toolbar found - test it! I found today on our own(!) "community-playground" a page External add ons for Firefox which led me to an external FF-Extension Add-On "Wikidot-button" with standard wikidot-links - very useful! Right click on a menu opens the page in a new page and left click in a new tab. CSS Per Category — Including Inexisting Pages! Something that's slightly annoying about Wikidot is that when it comes to creating new pages that previously didn't exist, the Live Template isn't taken into account. That is, if you use the CSS module in the Live Template, then that isn't applied to the page until after you save the page. All proceeding edits work fine, but the initial edit doesn't look how it's supposed to. But of course, they don't call me a Wikidot Super-Guru for nothing! Read on to see how it's done properly. A question about the missing "gallery" command for "external" images let me think about a possibility to simulate such gallery with external images.